Can we really call it Michelle Obama’s garden, when she isn’t the one who actually does any work? 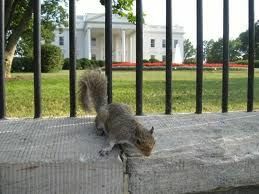 (Daily Mail) While neither Republicans or Democrats are winning in the government shutdown, there is one group that’s having a field day: the White House squirrels. The government shutdown coincided with the White House garden’s harvest season, and since much of the staff that tends to the garden has been furloughed the crop has gotten out of control. The staff that were allowed to stay are only allowed to water the plants. Triming, fetrilizing, transplanting, mowing and harvesting are all off limits. Gotta love that. Perfect encapsulation of Government. They can only water. So, the squirrels gorge. Which begs the question: why the heck doesn’t Michelle O get out and do it herself? Actual work instead of a photo op. She could drag the kids out for some exercise. And Barack, since he doesn’t seem to be doing any actual work that helps the country. Seriously, we have to pay people to deal with Michelle’s garden? The very definition of government waste.